A few blocks from the Amazon Spheres, chef Mark Fuller partners with Doug Kawasaki for a small spot with vegetables as the focus. Chef Mark Fuller might be known more for his fried chicken — just take a look at his spots Ma’ono in West Seattle and the Ma’ono window inside U Village’s Rachel’s Ginger Beer — but he’s also shown to have a deft hand with pizza and Chinese-inspired eats at his West Seattle spots New Luck Toy and Supreme. At ’Table (short for vegetable), he and partner Doug Kawasaki have whipped up a fast-casual spot with vegetables as the focus. The petite space, all concrete and windows, sits on Sixth Avenue, just a few blocks from the famed Amazon Spheres — far enough away, it seems, to discourage the Amazon masses to walk a block or two off their campus, leaving lunchtime fairly quiet here. The menu: There are only a handful of choices on the menu, with their ’Table burger getting top billing. The plant-based patty is also offered as a mix in a rice bowl. An avocado succotash, winter squash and quinoa salad, and roasted potatoes round out the offerings, alongside soda, beer and wine. The ’Table burger and mix are composed of kidney beans, hominy, eggplant, mushrooms, quinoa, carrots, onions, cashews, garlic, tomato paste and Marmite. You’ll see nearly all these ingredients repeated elsewhere in the menu — from the succotash and salad to the chili. Don’t miss: The ’Table burger, topped with American cheese, pickles and vegan tomato mayo is a soft patty, but one that sticks together nicely. 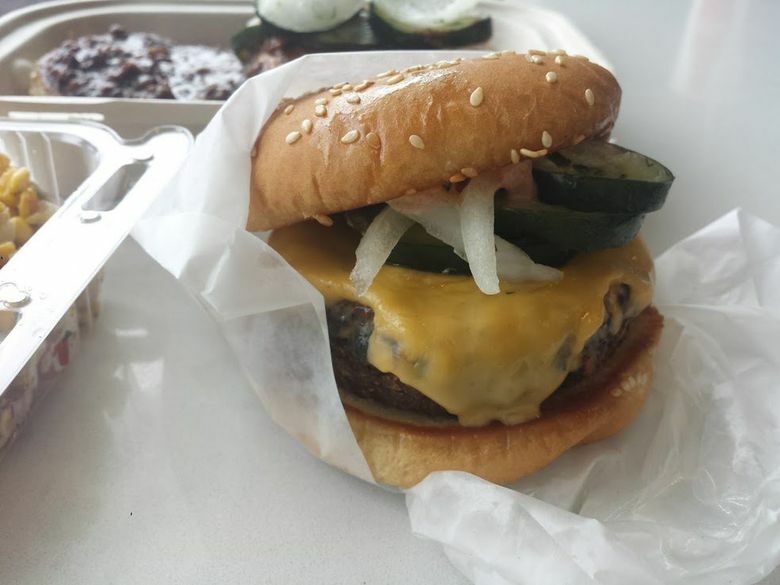 The house-made pickles are a little on the sweet side, despite visible dill, but they work with the savory burger. We also ordered a chili burger — which features a ’Table patty served open-faced and smothered with shiitake mushroom gravy — but found ourselves eating around the patty just to get to the chili. Some might say a chili without meat is just a vegetable stew, but this one was packed with flavor and a nice smokiness from chipotle adobo. It’s a great chili, meat or no meat. 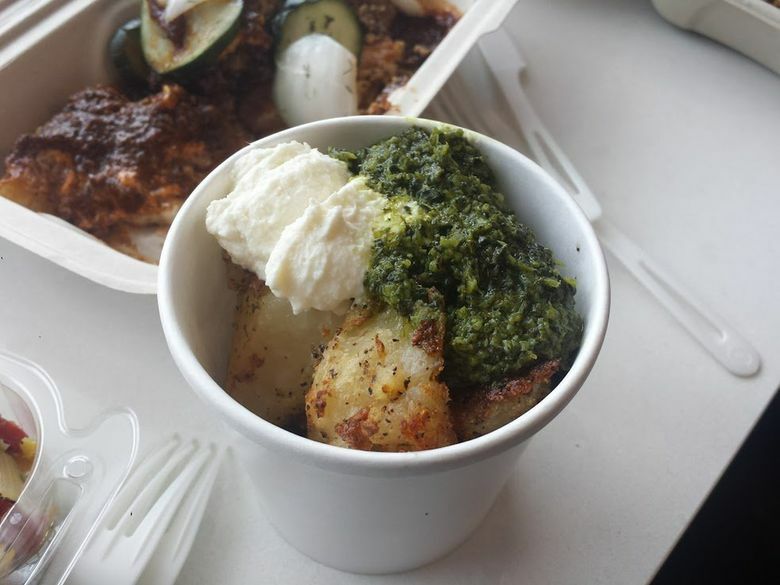 The roasted potatoes, topped with a halo of goat cheese and bright-green harissa, were nearly perfect. A crisp exterior yielded to a fluffy interior, and the combination of the vibrant, herbaceous harissa and creamy goat cheese was delightful. What to skip: Forget about a chili burger and go straight for the cup of chili, topped with chopped onions and Fritos (who doesn’t like Fritos?). Also, as much as I appreciate the concept of making a small menu’s ingredients work hard, the crushed avocado succotash missed the mark. 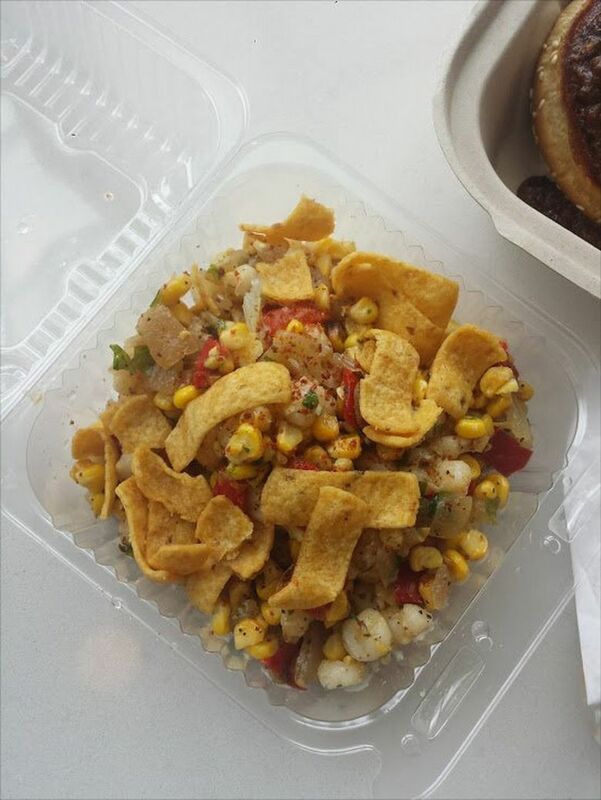 It featured a kitchen sink’s worth of ingredients but still managed to seem mushy and tasteless — and not to split hairs, but is a succotash without beans really a succotash? Prices: A ’Table burger ($9), chili cheeseburger ($12), potatoes ($6.50), succotash ($7), and two sodas ($6) totaled $40.50 before tax and tip, and was more than enough to feed two people.